Football, sometimes known as soccer, is one of the worlds’ most coveted games. Millions of dollars are invested in the game and people spend tons on tickets and merchandise. With such popularity, the game needs to adapt to changing times, but how can the sport be made to better serve the viewers as well as allow the referees to make better calls? We only need to look to the future! Live player stats can be monitored throughout the game. Items that will be cataloged is a multitude of information like the amount ran, accuracy, and time on the field. This could easily settle the arguments about which player is the best. We all know that some players have huge egos that can lead to dishonest behavior such as pretending to be hit hard. Impact visualizers will provide different colors in the event of a strong hit or a soft hit made by player against another. Impact visualizers could potentially put an end to babies rolling around on the field trying to get the opposing player another electronically displayed yellow card on their shoulder. For even better visuals, jerseys can be illuminated as well as carry live ads that will grant the spectators to register more precise movements made by players and draw in more money. Just how might these kits (uniforms) be powered, you ask? 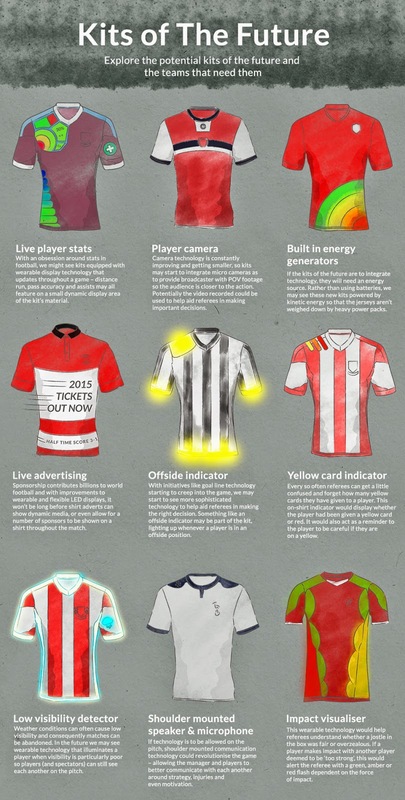 The kits will be powered by the kinetic energy of a player that will be converted to an electrical current. Yeah, the future.